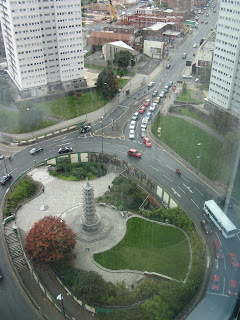 I have just arrived in Birmingham, England for the Conservative Party Conference. Here’s a shot from my hotel, the Radisson. Guess what? They are going through exactly the same financial crisis we are facing, except that here it’s the conservatives attacking labour in the same way Democrats are attacking Republicans in the U.S.
My driver here was a big Labour supporter from Nigeria. He had the convention on the radio and we were listening to a speech by the shadow chancellor of the exchequer, George Osborne, and was shouting at it. “The Tories are heartless! !” he shouted.